German Chancellor and U.S. President urge UN to quickly agree on tougher sanctions following North Korea’s latest nuclear test. German Chancellor Angela Merkel and U.S. President Donald Trump on Monday condemned North Korea’s nuclear test and urged the United Nations to quickly agree on tougher sanctions against Pyongyang, a German government spokesman said, according to Reuters. “Both agreed that the test of a hydrogen bomb means a new and unacceptable escalation by the North Korean regime,” the spokesman, Steffen Seibert, said in a statement after Merkel and Trump spoke by telephone. “The German chancellor and the American president expressed the view that the international community must continue to exert pressure on the regime in North Korea and that the United Nations Security Council has to quickly adopt further and stricter sanctions,” he added. 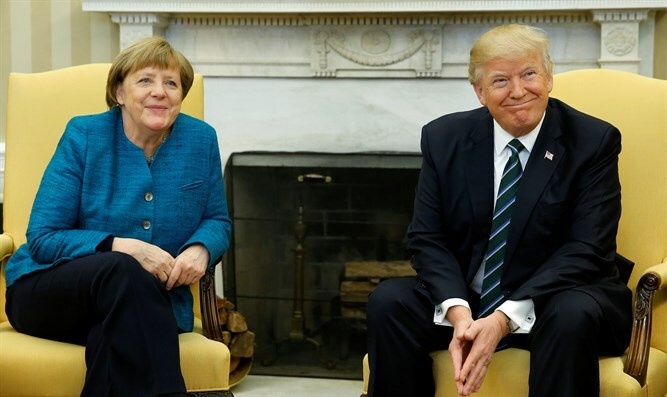 Merkel told Trump that Germany would push for tougher sanctions against North Korea by the European Union, Seibert said. “The aim is to dissuade North Korea from its violations of international law and to achieve a peaceful solution to the conflict,” he added. North Korea claimed Sunday that it successfully tested a hydrogen bomb that can be placed on an intercontinental ballistic missile (ICBM), its sixth nuclear test in recent years. In January of 2016, North Korea claimed it tested a hydrogen bomb, but experts cast doubts on those claims, saying the evidence points to a far smaller explosion. Sunday’s test followed threats by Pyongyang to attack Guam, a tiny U.S. territory in the Pacific. Those threats came in response to Trump’s warning that Pyongyang faced "fire and fury like the world has never seen" if it continued to threaten the United States with its missile and nuclear programs.